Eccles, William John. "Seven Years War". The Canadian Encyclopedia, 21 March 2018, Historica Canada. https://www.thecanadianencyclopedia.ca/en/article/seven-years-war. Accessed 25 April 2019. The Seven Years War (1756–63) was the first global war, fought in Europe, India, and America, and at sea. In North America, imperial rivals Britain and France struggled for supremacy. Early in the war, the French (aided by Canadian militia and Aboriginal allies) defeated several British attacks and captured a number of British forts. Montcalm, like British Commander James Wolfe, was killed at the Battle of the Plains of Abraham in 1759 (courtesy Library and Archives Canada/C-27665). The Seven Years War pitted the alliance of Britain, Prussia and Hanover against the alliance of France, Austria, Sweden, Saxony, Russia, and eventually Spain. The war was driven by the commercial and imperial rivalry between Britain and France, and by the antagonism between Prussia (allied to Britain) and Austria (allied to France). In Europe, Britain sent troops to help its ally, Prussia, which was surrounded by its enemies. However, the main British war aim was to destroy France as a commercial rival, and they therefore focused on attacking the French navy and colonies overseas. France, which was heavily committed to fighting on the European continent, had few resources to spare for its colonies. France found itself committed to fighting in Europe to defend Austria, which could do nothing to aid France overseas. Hostilities began in 1754 in the Ohio Valley, which both the French and British had claimed. In 1753, the French built fortifications in the area to strengthen their claim. In response, the governor of Virginia (then a British colony) sent militia colonel George Washington to the Ohio frontier. Washington ambushed a small French detachment, but was subsequently defeated by a larger French force. Even though war had not yet been officially declared, the British began planning an assault against the French in America, ordering Major-General Edward Braddock and two regular regiments to America in 1755. Other regiments would be raised in the colonies, and a four-pronged attack would be launched against Niagara, Fort Beauséjour on the border of Nova Scotia, Fort Duquesne on the Ohio River, and Fort Saint-Frédéric [Crown Point] on Lake Champlain (in what is now New York state). On learning of these movements, the French ordered six battalions under Baron Armand Dieskau to reinforce Louisbourg and Canada. Vice-Admiral Edward Boscawen and a squadron of the British navy tried to intercept and capture the French convoy, but captured only two ships. The British had even less success on land. The army advancing on Lake Champlain fought the French near Lake George, capturing Dieskau, but decided to abandon the campaign against Fort Saint-Frédéric; instead, they consolidated their position at the opposite side of the lake, where they built Fort William Henry. The proposed assault on Niagara collapsed due to supply problems and heavy desertion, and Braddock's army was destroyed by a small detachment of French soldiers and Aboriginal warriors. However, the British had some success in Acadia, capturing Fort Beauséjour with its small garrison in 1755. The Acadian settlers of the entire region were subsequently rounded up by the New England forces and deported (see History of Acadia). In April 1756, more French troops and a new commander, the marquis de Montcalm, arrived in Canada. The next month Britain declared war. The strategy of the French commander-in-chief and governor general, the marquis de Vaudreuil, was to keep the British on the defensive and as far from Canadian settlements as possible. Montcalm captured the British Fort Oswego on Lake Ontario in 1756 and thereby gained control of the Great Lakes. In August 1757, the French also captured Fort William Henry on Lake George. At the same time, Canadian and Aboriginal war parties ravaged the American frontier settlements. The Americans could not cope with these attacks and Britain was forced to send over 20,000 troops to the colonies and commit most of its navy to blockading the French ports. The French aim was to use a small army, aided by the Canadians and Aboriginal allies, to tie down these large British forces in the interior, thereby sparing more valuable colonies from attack. Despite the large numbers of British regulars arriving in North America, the French government refused to send more than token troop reinforcements. In 1758, the tide of war turned against the French, with the British launching several major attacks on French posts. In July, Major-General James Abercromby, with an army of over 15,000 British and American troops, attacked Fort Carillon (Ticonderoga), but was defeated by Montcalm and a force of only 3,800 men. However, the British also launched a successful amphibious attack on Louisbourg that summer, which opened up the St. Lawrence River to British ships. In August 1758, the British destroyed Fort Frontenac [Kingston, ON] with its stock of supplies for the western posts. France's Aboriginal allies in the Ohio region concluded a separate peace with the British, forcing the French to abandon Fort Duquesne. In 1759, the British captured Guadeloupe in the Caribbean, and mounted three campaigns against French fortifications on the mainland. Two British armies advanced on Canada while a third captured Niagara. The Royal Navy brought Major-General James Wolfe with 9,000 men to Québec, while General Jeffery Amherst advanced up Lake Champlain, only to halt at Crown Point. 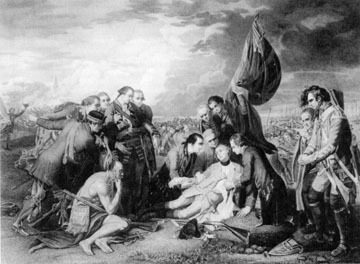 After maneuvering fruitlessly all summer, Wolfe induced Montcalm to give battle on 13 September 1759 outside Québec, and inflicted a shattering defeat in the Battle of the Plains of Abraham. (Both Wolfe and Montcalm died from wounds sustained during the battle.) The city surrendered a few days later. However, the British position at Québec was tenuous; the Royal Navy withdrew from the area before the winter, leaving the British garrison there isolated. The chevalier de Lévis took over command of the French army and the following April soundly defeated the British on the same battlefield (see Battle of Ste-Foy). The British retreated to Québec, and Lévis set siege to the city. On 16 May, he had to abandon the siege when British frigates arrived in the St. Lawrence River, dashing all hope of French reinforcements. The French army retired to Montréal, and was forced to capitulate to Amherst on 8 September 1760 (see Conquest), freeing the British forces for service elsewhere. In 1762, the British took Martinique, and only the intervention of Spain that year saved the other French islands in the West Indies. The dominance of the British navy was a deciding factor in the outcome of the war. The navy played a crucial role in the attacks on Louisbourg and the city of Québec, and successfully blockaded French ships from reaching the colonies. It also defeated the French plan to invade Britain. France and Spain had organized a major expedition for the invasion of England, but the British naval victories at Lagos, Portugal, in August and Quiberon Bay, France, in November 1759 made this impossible. Despite British military and naval victories, by 1760 the British were staggering under a colossal national debt. The war minister, William Pitt, was driven out of office in 1761 by the new king, George III, and peace negotiations began. The first minister of the French government, the duc de Choiseul, was determined to regain the valuable sugar colonies of Martinique and Guadeloupe, and to retain a base for the Grand Banks fisheries. He also wanted Cape Breton, but had to settle for the tiny islands of St-Pierre and Miquelon as a fishing station. To force the stubborn Spanish king to agree to peace terms, France ceded the vast Louisiana territory to Spain to compensate for the surrender of Spanish Florida to the British. France also left Canada to Britain, as it was less valuable commercially than either the sugar islands of the West Indies or the fishing islands of the north Atlantic; Canada’s size and location also made it an expensive colony to defend and maintain. In addition, Choiseul was convinced that the American colonies, which no longer needed British military protection, would soon strike out for independence. The French loss of Canada would be as nothing compared to Britain’s loss of its American colonies. Despite some opposition in Britain from those who foresaw what Choiseul privately predicted, Britain returned Guadeloupe, rather than Canada, to France in the Treaty of Paris (1763). Twelve years later, the American colonies rose in revolt against Britain. Ironically, it was only with the military aid of the French that they finally gained their independence. The Seven Years War was a crucial turning point in Canadian history. With the Treaty of Paris of 1763, France formally ceded Canada to the British, and largely withdrew from the continent. The Seven Years’ War therefore laid the bicultural foundations of modern Canada. However, the removal of France as a North American power gave Anglo-American colonists greater confidence, as they no longer needed the protection of the British military. This led indirectly to the outbreak of the American Revolution in 1775, which would further influence Canadian identity and boundaries, including the influx of Loyalists and the creation of Upper Canada and New Brunswick. Fred Anderson, Crucible of War: The Seven Years’ War and the Fate of Empire in British North America, 1754–1766 (2000); Daniel Baugh, The Global Seven Years’ War, 1754–1763 (2011); Phillip Buckner and John G. Reid, eds., Revisiting 1759: The Conquest of Canada in Historical Perspective (2012); Colin G. Calloway, The Scratch of a Pen: 1763 and the Transformation of North America (2006); William Fowler, Empires at War: The Seven Years’ War and the Struggle for North America, 1754–1763 (2005); Francis Parkman, Montcalm and Wolfe (1884). The Seven Years' WarAn illustrated overview of the Seven Years’ War from the Canadian War Museum website. Click on the images for larger views. The Treaty of Paris (1763) and North AmericaMajor provisions and outcomes of the Treaty of Paris of 1763. From the University of Ottawa website. The Culture of the Seven Years’ War: Empire, Identity, and the Arts in the Eighteenth-Century Atlantic WorldA collection of essays on the interdisciplinary and multinational dimensions of the Seven Years’ War. From indigo.ca. William Fowler on the Seven Years' WarAuthor and history professor William Fowler discusses the lasting impact of the outcome of the Seven Years’ War. From YouTube. Extract from a manuscript journal, relating to the siege of Quebec in 1759Read a digitized copy of a journal that chronicled the siege of Quebec in 1759 as recorded by Colonel Malcolm Fraser, then Lieutenant of the 78th (Fraser's Highlanders). From archive.org. THE SIEGE OF QUÉBEC: AN EPISODE OF THE SEVEN YEARS' WARDetails about pivotal events in the Seven Years’ War. With links to detailed biographies of primary participants. From website for The National Battlefields Commission. 1759: From the Warpath to the Plains of AbrahamA colourful multimedia presentation on the major events of the Seven Years’ War. From The National Battlefields Commission.